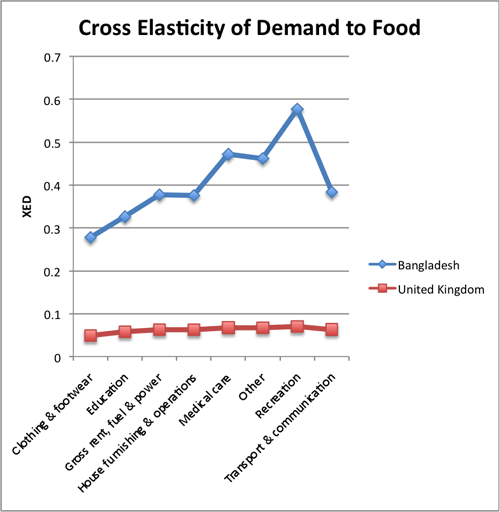 This graph shows the Cross Elasticity of demand (XED) for various goods with respect to food. What this means is that if the price of food rises 10%, then in the UK, demand for education falls by about 0.05%. 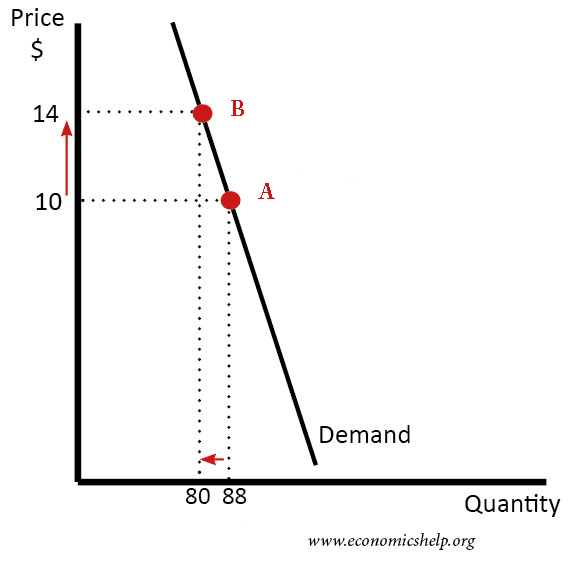 The highest cross elasticity of demand is for recreation. Recreation is what we would call a luxury good. If income falls, we can lose spending on recreation because it is not essential. It shows that – for a poor country like Bangladesh – if food prices go up, it means a significant fall in spending on recreation. Demand in the UK remains mostly unchanged. It’s a good example of how rising food prices will have different effects in alternative countries. When food prices rise in the UK, it is an inconvenience. When food prices rise in developing countries, it makes families rearrange their whole budget. Update to What explains the volatile price of food? According to US Dept of Food, the price elasticity of demand for bread and cereals at 0.04 — that is, it would take a 25 percent rise in price to induce a 1 percent fall in consumption. A change in price leads to a smaller percentage fall in demand.